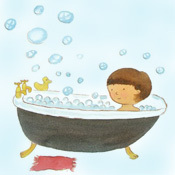 Turn all those half empty bottles of shampoo into bubble bath for your Mom, your friend or yourself! If unscented shampoo is used you can experiment by adding scent and color. Use recipe to mix bubble bath. Use measuring cup or funnel to pour into decorative bottle. Cap bottle and wipe dry. Print label. Use markers to design your own label on the blank provided or use one of our designs. Cut out label. Place on bottle. Cut a piece of contact paper using the pattern provided. Place over label to keep it dry.